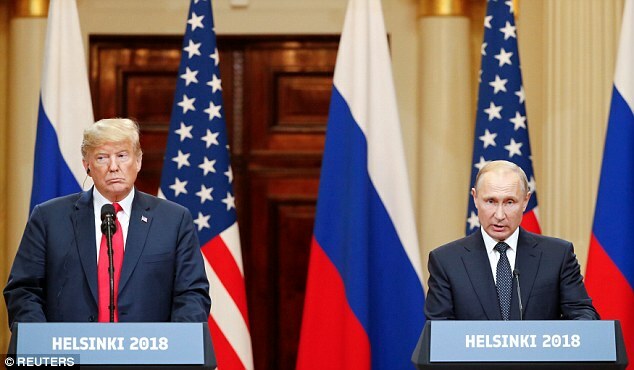 President Donald Trump wouldn't call Russia an adversary in an interview taped after his explosive press conference and before he read a statement acknowledging Russia did interfere in the U.S. elections. 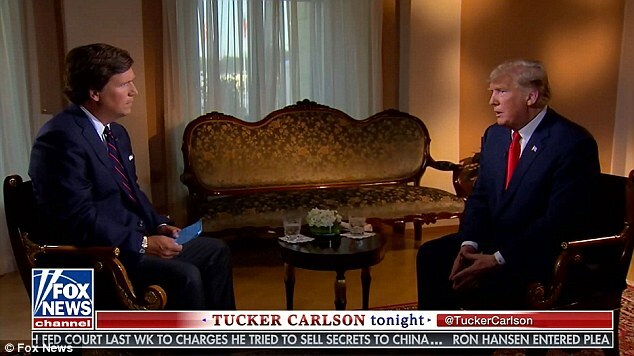 Trump conducted the interview with Fox host Tucker Carlson after his Helsinki press conference where he created a firestorm by saying he believed Russian President Vladimir Putin over the U.S. Intelligence Community, which concluded Russia did hack. 'Well they are a strong military,' Trump said, complimenting Russia. 'But their economy is much smaller as you know than China and I don't want to even use the word "adversary," we can all work together,' he said. 'We can do great. Everybody can do well and we can live in peace, but I think it's very, very important and I've watched your show a lot and I see how you're talking about the - really the magnificent size of China, you look at the size and what they've done in a fairly short period of time, that's because of a lot of bad leadership on behalf of the United States. We allowed that to happen,' Trump said. 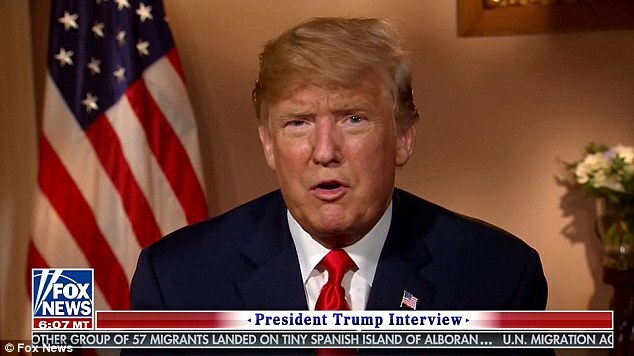 The Fox host also asked Trump what he thought of the timing of the indictments of 12 Russian spies accused of carrying out the hack – perhaps suggesting the Justice Department wanted to influence his summit with Putin. Trump was informed in advance. 'Well, I don’t think of the timing as much as I think of other timing. Barack Obama was President. I wasn’t President when this happened. Barack Obama was the President of the United States when all of this - this was pre - this was when I was getting elected, so I was being elected, and I guess, I assumed this stuff all took place in that area or before,' Trump said, keeping blame on his predecessor as he has done on Twitter. 'And he was President and they informed him of it and he did nothing. And then after I won, see, he thought Hillary was going to win, after I won, he said, "Oh, this is a big deal.." Trump continued. 'Well, it wasn’t a big deal as long as she won. So it's a disgrace, and frankly, it's a disgrace what's happening to our country,' he said. Carlson also brought up Trump's rant about Democratic servers during his Helsinki press conference. 'Would be possible for you to direct the Department of Justice, FBI to take possession of the server and have, assuming no government investigators looked at it, which seems to be case right now, and gets to the bottom of it,' he asked. The DNC handed over data that a computer security firm pulled from the hacked server during the campaign, and the latest indictment makes detailed references to information on it. Trump brought up the server as well as raising a conspiracy theory about a Democratic IT staffer who worked for Democratic Rep. Debbie Wasserman Schultz and who pleaded guilty to a bank fraud charge. 'So as I've told you and the answer is absolutely, it is possible, and maybe at some point, it will be done, but I've wanted to stay out. My Department of Justice is the one branch, the one group that I'm very little involved and the same with the FBI,' Trump said, although he later laced into FBI lawyer Peter Stzrok. 'Am I disappointed that they're not looking at all of the crooked things taking place on the other side? Like the Pakistani man who left with these three servers- knew everything about Schultz, new everything, new Debbie Wasserman Schultz, and I think he had three servers. I believe they even have them, and they don’t want to use them, Trump said. 'Or the DNC, where the server was never taken by the FBI. They went in there and [Clinton campaign chair John] Podesta or somebody threw them out of the office. They said, "Get out of here." 'Maybe if they go after other people, like there's no tomorrow. So, I have purposely - you understand that. I spoke to you about it before. As they said, "You're winning, don’t get involved," because I don't want to have people accuse me of anything, so I've stayed very much uninvolved, but am I allowed to be involved? Totally. Will I be involved? We'll have to see as it goes along,' Trump said. Carlson asked asked Trump why his son should 'go to Montenegro to defend it from attack?' – a reference to the Article V treaty obligations that commit all member nations to coming to defense of the others. NATO members mustered troops to defend the U.S. following Sept. 11th and put troops into Afghanistan. 'I understand what you're saying. I've asked the same question. Montenegro is a tiny country with very strong people,' the president offered. 'Yes, I'm not against - or Albania,' explained Carlson, mentioning another small nation on Russia's periphery. 'No, by the way ... They have very aggressive people. They may get aggressive and congratulations, you're in World War III, now I understand that - but that's the way it was set up,' he responded. He slammed John Brennan repeatedly in comments released from his interview with Tucker Carlson, which he recorded immediately after one with the network's Sean Hannity. 'I think Brennan is a very bad guy, and if you look at it, a lot of things happened under his watch,' Trump told Carlson. 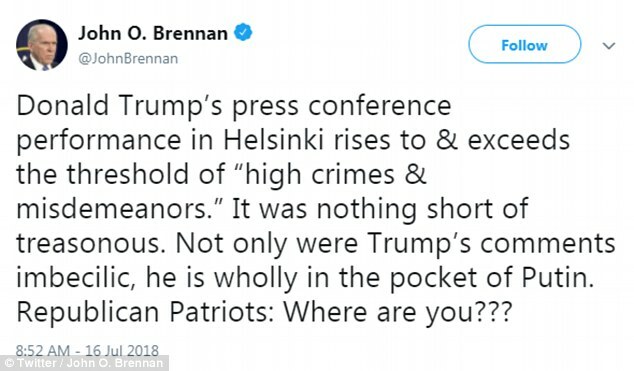 Brennan's tweeted criticism on Monday shortly after the press conference with the Russian president included a call for impeachment. On Tuesday the former chief spy doubled down, telling NBC's Today show that he was right to warn about treason. 'When I use the term, this is nothing short of treasonous I equate it to the betrayal of one's nation, aiding, abetting, giving comfort to an enemy,' he said. But Trump equated the former Obama official to a series of his favorite targets at the FBI: anti-Trump lovers Peter Strzok and Lisa Page, fired director James Comey and former deputy director Andrew McCabe. 'I also think that when you watch Peter Strzok and Lisa Page, when you watch all of the things that have happened - Comey, you take a look at that and McCabe who has got some pretty big problems I assume, you look at the deception, the lies – these are people that in my opinion are truly bad people, and they’re being exposed for what they are,' the president said. Brennan spoke out on Monday amid a firestorm of bipartisan criticism. Brennan has been one of the president's harshest critics. And he was CIA chief during the 2016 election when the Obama administration was said to have known Russia was trying to interfere in the presidential contest. 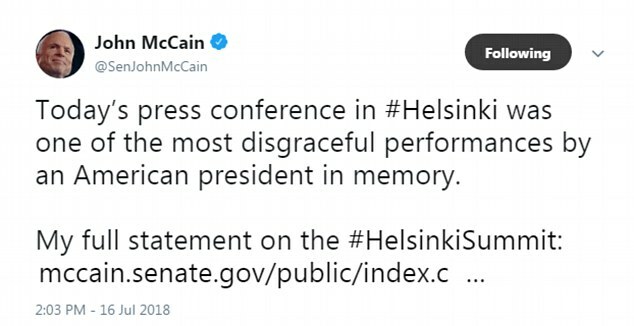 He has not held back in the harsh language he uses to describe the president. Trump fired back. He attacked Brennan on Twitter after the op-ed appeared, quoting a former Secret Service agent who appeared on 'Fox & Friends' and called Brennan a liar. 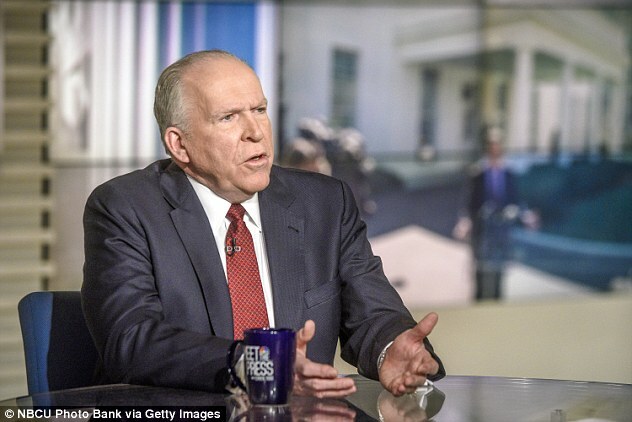 On Monday, the former CIA chief was expressing his fury that the president declined to back the U.S. intelligence community's assessment that Russia interfered in the 2016 presidential election. Trump was asked if he believed his Russian counterpart or his intelligence chiefs. 'I don't see any reason why it would be' Russia, the president said. Brennan wasn't the only former intelligence official to express disbelief at Trump's statement. 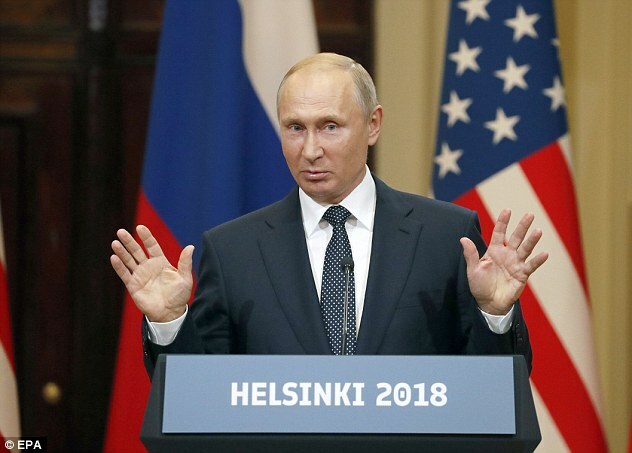 'On the world's stage, in front of the entire globe, the President of the United States essentially capitulated and seems intimidated by Vladimir Putin. So it was amazing and very, very disturbing,' Clapper said on CNN Monday afternoon. Putin was asked in Monday's presser if he had any dirt on Trump or his family. The Russian president said he didn't know Trump was in Moscow for the 2013 Miss Universe pageant. The president said if the Russians had anything, it would have come out. 'If they had it, it would have been out long ago,' Trump said.